MEXICO CITY, Sept. 4 (UPI) — Piedras Negras, a city across the U.S.-Mexico border from Eagle Pass, Texas, saw the arrival of more than 90 refugees in the past two months from war-ravaged African countries trying to flee to the United States. Eagle Pass has also seen 15 migrants from Latin American countries dying as they tried to enter the United States this year, either drowning while crossing the Rio Grande river or from heat stroke. Many of the African refugees had been travelling for at least three years, the Rev. José Valdés, an advocate for migrants’ rights told UPI in a phone interview from Piedras Negras, where the Catholic Church runs a shelter. “After leaving Cameroon, Angola and the Congo they arrived in South America. Then they made it to Guatemala, and after crossing into Mexico at Tapachula, Mexican authorities provided them with two-week transit visas so they could cross through the country legally to the United States, where they are seeking asylum,” Valdés said. “They were fleeing war but some were also escaping persecution for their beliefs,” said Valdés, who serves as media spokesman for the Piedras Negras-based Casa del Migrante Frontera Digna shelter and advises immigrants there. “The Africans came to Piedras Negras because they heard it is a safer border city than the rest,” Valdés said. To the east is the state of Tamaulipas, one of Mexico’s most dangerous states and a hotbed of organized criminal activity. To the west is the border metropolis of Ciudad Juárez, which has experienced a surge in violent homicides. Valdés said the African refugees waited in Piedras Negras until they obtained an appointment with U.S. immigration officers to make their asylum claim. This summer, Customs and Border Protection officers routinely told asylum seekers attempting to enter U.S. ports of entry they would have to wait in Mexico until an appointment with an immigration officer became available. The practice of making asylum seekers wait in Mexico sparked criticism as possibly in violation of U.S. international treaty obligations. 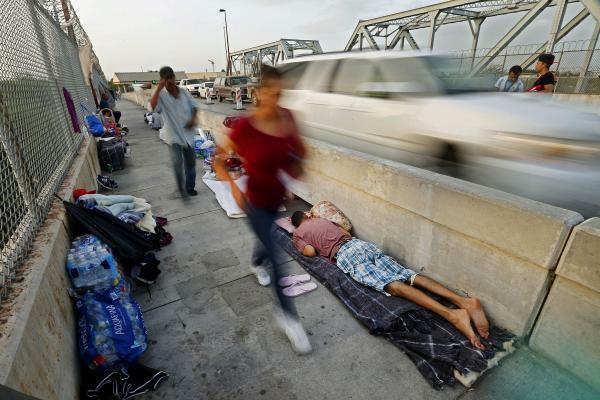 It also forced migrants to sleep rough in Mexican border cities like Tijuana, Matamoros and Nogales, a situation Piedras Negras wanted to avoid. Until last week, the number of Africans arriving each day overwhelmed Piedras Negras’ two migrant shelters. One of the shelters is run by the city and usually only accommodates minors, but city officials relaxed that restriction to house the African refugees. Officials also turned a gym into a temporary shelter. Overwhelmed, city officials reached out to U.S. immigration authorities for help, Piedras Negras Mayor Sonia Villareal told Mexican newspaper Zócalo. For three weeks, the U.S. accepted 12 asylum applications a day instead of just three, to clear the backlog. “If other asylum seekers now turn up at the bridge and U.S. authorities say they have no appointments available, they turn them back. The situation has returned to what it was,” Valdes said. José María Fraustro, the state of Coahuila’s Interior Minister told Mexican news media about 25 migrants arrived daily during the summer months at Piedras Negras. Now, Fraustro said only about five migrants a day arrive at Piedras Negras. That’s because Mexico’s immigration authorities have deployed agents on northbound highways for immigration checks, he said. Authorities also say they are telling refugees they have the option of requesting political asylum in Mexico. Meanwhile, it’s been a deadly year for U.S.-bound migrants who swim the river. Mexico’s consul in Eagle Pass, Arturo Rueda Brown, said 15 migrants have died this year while trying to cross the Rio Grande into the United States — the same number as died crossing the same stretch of river in all of 2017. “In one week we had four drowning deaths,” Valdés said. U.S. Customs and Border Protection issued a press release describing how its agents in Eagle Pass rescued three families from the river in a 24-hour period starting Aug. 24. On Sunday, a Border Patrol agent shot a 48-year old Honduran man in the arm after he had crossed the river and been apprehended, according to a CBP press release. Border Patrol said the officer feared assault and shot the man, who was then taken to hospital in San Antonio for treatment. He was then transported back to Eagle Pass to initiate deportation. The unnamed Border Patrol officer has been placed on administrative leave pending an investigation. PrevASX 200 Technical Analysis: How Long Before Bulls Quit Trying?